We are excited to be running a joint webinar with Qzzr this Thursday at 11.30am ET on How Quizzes Can Enhance Your Content Marketing. You can register here. Which Taylor Swift song is this lyric from? Is your content marketing plan more Don Draper or Donny Osmond? You just can’t not have a go…Quizzes are one of the more addictive and shareable forms of content out there. That’s why if you’re in content marketing, you’ve got to be all over quizzes. At BuzzSumo and Qzzr, we’ve looked at a lot of quiz data and what works, and we’re excited to share some insights and practical tips for the content marketer looking to become that killer quizzer. Q1: The Average quiz gets shared how many times? 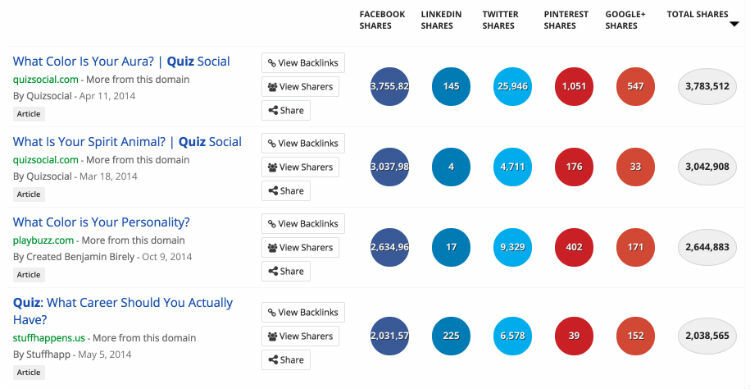 Our BuzzSumo data shows that on average a quiz gets shared 1,900 times. That’s quite a lot higher than you might get from an infographic or longer form article (which will likely take longer to create). However, some quizzes go way beyond 1,900. According to our data, the top shared quiz over the last 12 months was ‘What colour is your aura’, with nearly 4 million shares (clue: your aura is the same colour as that damn dress). The top 5 quizzes in the last 12 months all had well above 1.5 million shares. If you’ve got other content marketing items that are regularly getting those kinds of share volumes, we’d like to hear about it. The great thing about creating a quiz is that you can re-use existing content to create them. A quiz by its nature is based on knowledge you already have. If you’ve got checklists, e.g. 10 must-have elements of a content marketing strategy, you can make that a quiz: Is your content marketing strategy a stud or dud? Take the quiz. Quiz tip 1: Check over your best performing content. Could you turn it into a quiz? Hint: start with checklists. Q2: How many quiz types should content marketers use? Graded quizzes – e.g. the hardest Frozen quiz you’ll ever take, can you name these ten Taylor Swift lyrics – you know the type. These give you a score which you can share on social, e.g. post to Facebook. Outcome quizzes – e.g. which Star Wars leader are you? These personality test quizzes give an outcome, we’re most like Yoda, we should drive a Skoda, and so on. Both appeal to our most primal desires: to know more about ourselves, and to show other people how good we are. Graded quizzes give us the chance to show how smart we are. Newspapers and publications regularly use them to enable their readers prove their intelligence (and by extension, associate that intelligence with reading their paper). Outcome quizzes are even more popular – the top 5 most shared quizzes last year where all in this genre. Why? Blame the Cosmo quizzes your mother loved – we all want deeper insights about ourselves, and we’ll look for it anywhere – yep, even in a quiz called ‘What is your spirit animal’ (3 million shares in last year – roarrr!). Outcome quizzes are also reassuring. We’ve made certain decisions about where we think we should live, what job we should have – so when we see a quiz called ‘what job should you really have’ we need to take it to reaffirm our decision making with a little independent validation: ‘Oh thank God, the Quiz said I should be a content marketer’. Outcome quizzes are easy to make, once you decide the genre for the outcomes. Going back to our list of 10 must-have content strategy elements for example: Could you create a quiz that takes say 3 Mad Men characters and has each of them apply or ignore the strategy elements? Boom. You just made TV show outcome based quiz on content marketing. You’re all sorts of awesome. Quiz tip 2: Consider producing an outcome and graded quiz based on the same piece of content to see what’s involved. And make sure you use a tool that makes it easy to create the quiz – Qzzr would be our recommendation of course. Q3: People share quiz outcomes mainly on….a. Facebook b. Twitter c. LinkedIn d. Google+? Whether you buy into the science or not, you’ve got to buy into the sharing. One of the real reasons that content marketers have got to plug into quizzes is how shareable they are. People love to share their scores from a quiz. 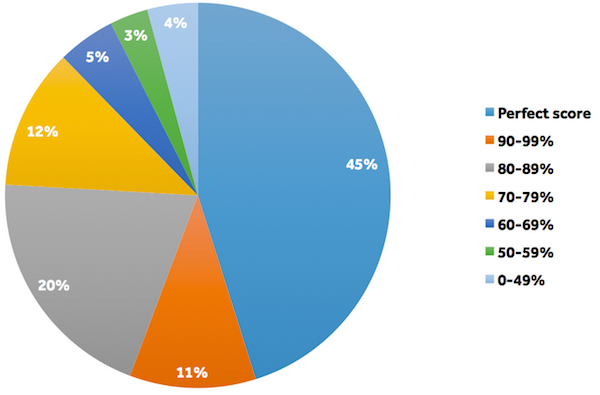 The main place where people share is Facebook: 84% of Social Media shares of quizzes are on Facebook. Perhaps not surprisingly, more business focused networks like LinkedIn see much lower sharing. 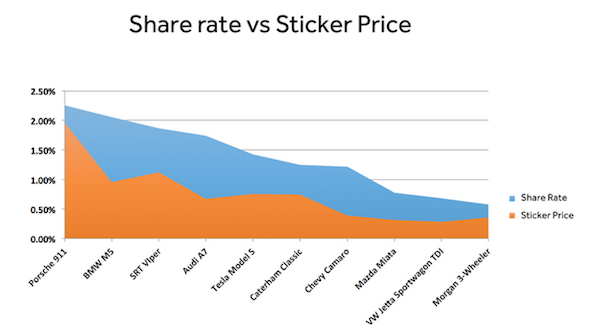 Almost 80% (76%) of shares come from people who scored in the top 20%. And an astounding 45% of shares come from people with a perfect score. Only 12% of shares came from scores of 69% and below. Question 4: Do people share if they don’t like the outcome? The high share ratio for high scores makes sense for graded quizzes, but what about outcome quizzes where there’s no right answer? People do still share if they’ve come out with a personality or character that they think puts them in a good light. This can be subtle, for example in a quiz like ‘Which Walking Dead Character are you?’, sharing data showed that several characters can be favoured – it’s not as binary as people share hero results only. As you can see, the data tracks closely. I’m more likely to want people to see I should buy a Porsche or BMW than a VW Jetty. If you work for automotive clients, take note before you create a ‘which type of car are you’ quiz..
Quiz tip 4: In outcome quizzes, make sure every result is something people are proud to share. If you’re creating outcome, personality based quizzes, think about the social implications of sharing, and make sure the potential outcomes are equally sharable. You don’t want people thinking ‘I got Mazda – heck, maybe true but I sure don’t want to share this’. Not sharing = bad content marketer, bad. You can fix this through the description of the outcome, emphasising the positive attributes of the character or outcome. It’s the ‘why’ you want people to be keen to share. And of course you need to think about the next action. Is there an offer or promotion associated with your quiz? Is it specific to the results people get or for everyone? Think about the next action you want people to take after taking the quiz. Question 5: What colour is that damn content marketing dress? Topical quizzes are well placed to pick up more shares. 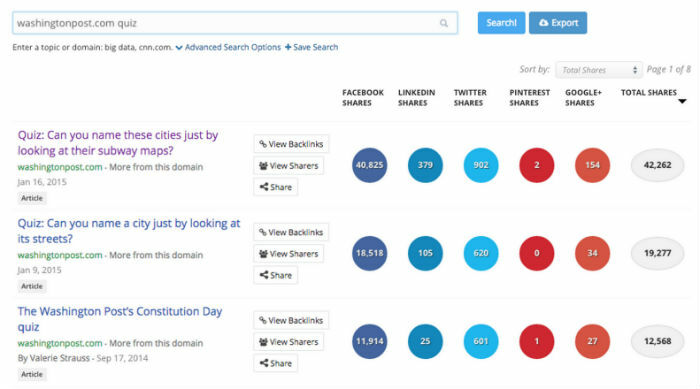 With BuzzSumo we can analyse the most shared content during a particular period, so we can see that during Super Bowl, Holiday seasons, themed quizzes abound. And of course, a quiz is a really quick way to newsjack a topic, such as a breaking meme or a show that’s returning, or a celebrity having a moment. Quiz tip 5: Stay on top of what’s trending. Use a tool like BuzzSumo – you can create alerts for keywords, your brands, your competitors brands – and then ask yourself – how might I turn this into a quiz? During political campaigns, newspapers do this well, regularly running ‘Who should you vote for’ outcome quizzes. Of course, you got to act fast – Use a tool like Qzzr to get the quiz out there, while the subject is still hot. So that’s some tips from us – but what content marketing quiz tips work for you?